Lisowczycy by the Polish painter Juliusz Fortunat Kossak (1824-1899). 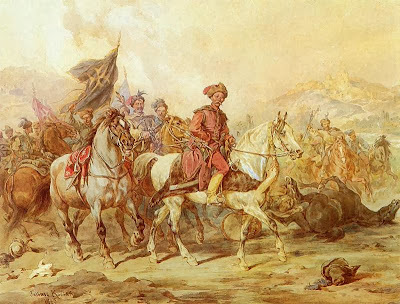 The Lisowczycy were a irregular unit of Polish–Lithuanian light cavalry in the 17th-century . The Lisowczycy took part in many battles across Europe and the historical accounts of the period characterized them as extremely agile, warlike, and bloodthirsty. Their numbers varied with time, from a few hundreds to several thousands. The fought first in Polish wars and later as mercenaries in the Thirty Years War.